1. What is a Cat Cafe? Cat Cafe's are all the rage in Japan with roots originating in Taiwan in 1988. These Cafe's are very popular with Japanese locals as well as tourist who enjoy our feline friends. More and more Cat Cafe's are popping up throughout the world including Germany, France, and the United Kingdom. America is also catching on with the first pop-up cat cafe in New York. You can now cuddle kitties while sipping coffee in Oakland, Denver , San Diego, Portland, New York and coming soon Washington DC and many more! The general concept is that a Cat Cafe houses cats and allows visitors to come cuddle them, usually for a specific length of time such as a hour, while enjoying beverages and snacks. The atmosphere is not hustle and bustle like a regular cafe, instead, a Cat Cafe is calm and serene for all its guests. Cats are generally available through adoption as well through a local Humane Society. Cat Cafe's are a wonderful place for cats and people alike! 2. Can I bring my own cat? No outside kitties are allowed. All cats will come from the Lawrence Humane Society and will be up for adoption. A large part of a cat cafe is ensuring as many cat as possible stay out of cages and find a permanent loving home. 3. Are you making food in house? Nope! All food will be provided from a local cafe. We may have coffee machines in order to make beverages, depending on regulations from the Department of Agriculture. If we cannot make coffee in house we will have self-serve coffee available. 4. Where is the cat cafe going to be located? 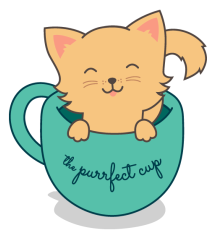 The Purrfect Cup is still looking to obtain a permanent home. Once find one, we will let you know. 5. How much is the cover fee? Pricing will be released closer to launch. Stay tuned!